The half moon shone radiant against the sapphire sky as the morning sun lit the sandstone peaks across the valley. As I paused to take in the rugged grandeur of the Seradina Bedolina Municipal Archaeological Park and wondered how many sunrises have these mountains seen and by whom? 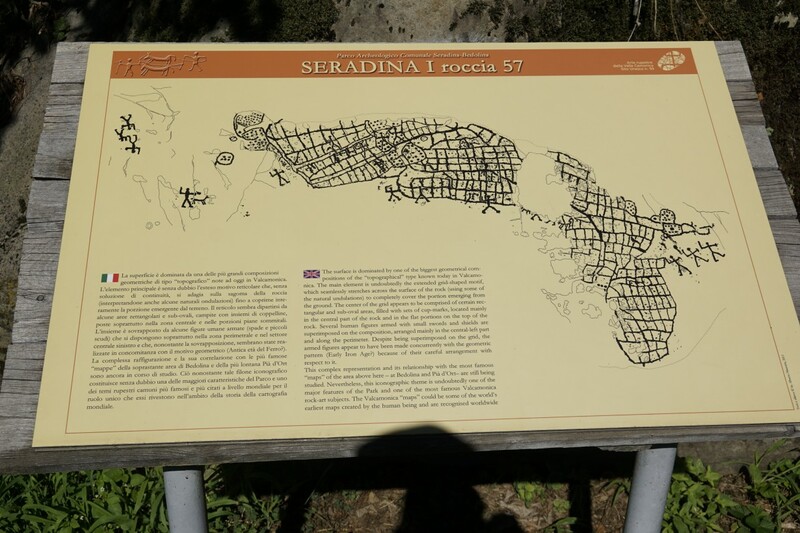 Questions such as these is what lured Franz and I to this ancient site in Capo di Ponte, Italy. 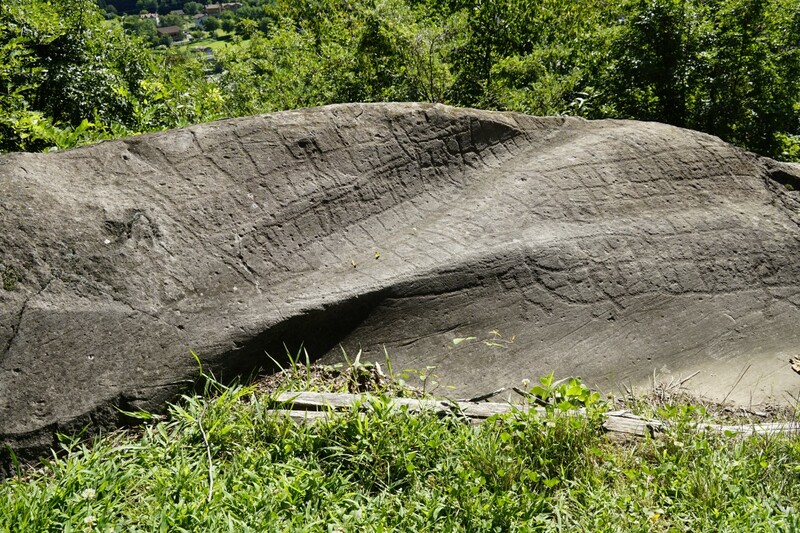 The Camonica Valley holds more than 150 engraved rocks with inscriptions and a thousand figures that depict the long ago dwellers in their daily and religious life as well as in more aggressive activities such as in hunting and fighting. The engravings span from the Late Prehistoric through the Roman Age with the majority dating from the Iron Age. The most famous engravings include the “Rock of the Map” and the symbol of Lombardia, the Rosa Camuna. The petroglyphs are found on the western side of the valley and the conditions created from the sunny mountainside allows for an interesting combination of succulents and cacti along with a variety of alpine flowers set among the low growing evergreens. We were amazed at the access of the park that was unregulated with limited signage warnings but for the most part visitors were free to roam the park at will. We even came upon a group camping site with children running about despite it being set among the ancient petroglyphs. To gain a more in depth knowledge of the area we ventured to the commune of Capo di Ponti where the Camonica Valley National Museum of Prehistory is located. The museum was well worth the time and included an extensive collection of engraved steles and menhirs along with informative and interactive exhibitions that are a treasure trove for history buffs like me. Each floor focused on a theme ranging from the sacred and religious sites to material culture offering the viewer a greater understanding of the region’s earlier inhabitants and a fascinating look into their past.